You have your rocky road ice creams, your rocky road candies, even rocky road cakes and cupcakes. Now I have gone and martini-ized this classic for happy hour! Aren't you glad I did? Rocky Road ice cream (known also as Heavenly Hash - especially in Britain and Canada) was created by William Dreyer in 1929. Inspired by a chocolate, marshmallow and nut candy bar, Mr. Dreyer sat down and took his wife's sewing scissors to some marshmallows, added some walnuts and tossed them into chocolate ice cream. At some later point almonds were substituted for the walnuts. It wasn't until after the Wall Street Crash of the same year that Mr. Dreyer named the ice cream "rocky road". There is also candy using the same ingredients known as Rocky Road, and even cakes, pies, cupcakes and cookies. Here I've taken the classic flavors of chocolate, marshmallow and almonds and turned a depression inspired treat into a twenty-first century cocktail for a truly interesting dessert cocktail. 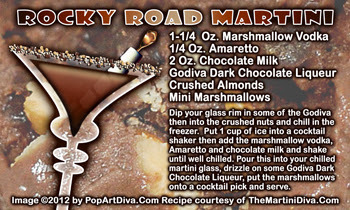 Purchase the Rocky Road Martini on a fun, mailable postcard.